A black and white photograph of three girls standing in front of a blossoming apple tree at Red Wing Orchards. The three girls are identified as Jane Holliday, Naida Worrel and Shirley Disney. 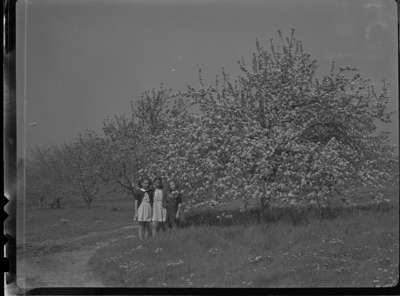 Blossoms at Red Wing Orchards, May 23, 1946, Marjorie Ruddy. Whitby Archives A2013_040_1171.